Sasquatch are reported to exist all over the North American continent, to my surprise. I have just been told that Leif Erikson/Ericcson apparently saw one in the late 900’s [see bottom of page for more on this]. Another story has it that North West Company explorer David Thompson was shown a set of supposed Sasquatch footprints in 1811. Thompson was shown large-sized tracks, all right, but were they Sasquatch? Everyone loves their Sasquatch, but according to some Sasquatch researchers — the area that Alexander Caulfield Anderson passed through in 1846, on his way from Kamloops to Fort Langley, is a hot-spot for Sasquatch! J. W. Burns, a schoolteacher who lived on the Chehalis Reserve near Harrison Hot Springs, B.C, was the first man to write down Native stories of the creature. In 1927 a major magazine published a series of his stories, and the Sasquatch slowly made its way into British Columbia’s history. In case you are absolutely unaware of what a Sasquatch might be, the following description comes from David G. Gordon’s book, Field Guide to the Sasquatch (Seattle, Sasquatch Books, 1992). These ape-like “humanoids” are reported to stand between six and eleven feet tall, and vary in weight from 700 pounds to over a ton. They walk erect, have monkey-like features, and are covered in dark, rich auburn or black hair. Their easily located footprints — spotted much more often than the creatures themselves — are reported to be fourteen to eighteen inches long and seven inches in width. Thurs. 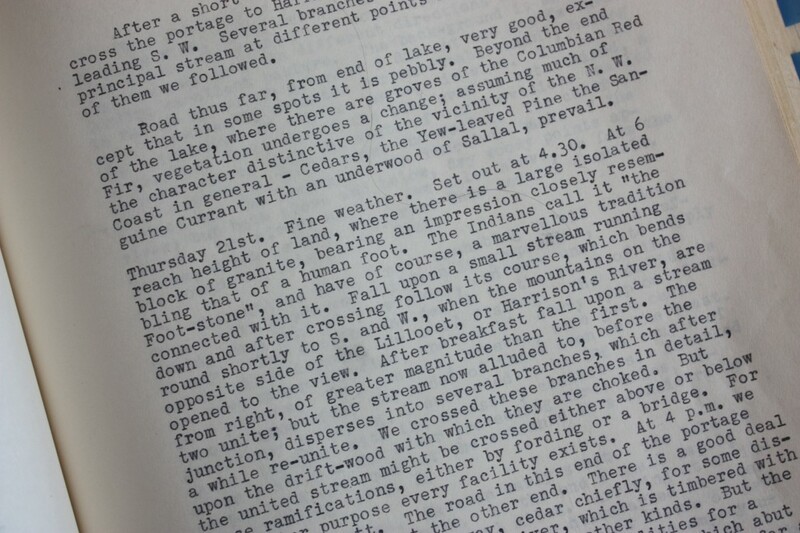 21st [May, 1846] Fine weather. Set out at 4.30. At 6 reach height of land, where there is a large isolated block of granite, bearing an impression closely resembling that of a human foot. The Indians call it “the Foot-stone,” and have, of course, a marvelous tradition connected with it. Other researchers state that Anderson and his men were stoned by a family of Sasquatch entrenched behind rocks on a mountainside as they made their way through the narrow Fraser Canyon in 1864. Still others state that Anderson wrote letters to the HBC telling of his encounter with the Sasquatch; if so, they have never been found. Nor is there any mention of any such creature in Anderson’s later writings, though he wrote about every animal he encountered from the Mountain Caribou to the tiny hummingbird! Nor did he mention this human-like creature in his descriptions of the Natives of the territory, and their many traditions. It is fairly easy to discover the beginning of the Sasquatch story and Anderson’s connection with it. The story involves some very interesting persons — all responsible newspapermen who worked together at the Province newspaper in the mid-1900’s. Probably all three were members of Torchy Anderson’s Rum-Tum-Tum Club (Torchy would post a sign with RTT on the meeting room door and all would stay after work to drink rum and share stories). These men were: Bruce “Pinky” McKelvie, H.H.C. “Torchy” Anderson, and John Green. “Torchy” Anderson was Alexander Caulfield Anderson’s grand-son, born in Calgary in 1894. He came to the Province newspaper in 1928 and worked with McKelvie. In addition to all this, Torchy knew his uncle, James Robert Anderson, son of Alexander Caulfield Anderson. James had written his memoirs, and included his father’s journal in them. On James’ death in 1930, Torchy inherited his uncle’s family collection, including the memoirs. So, Torchy Anderson owned a copy of his uncle’s memoirs, which contained Alexander Caulfield Anderson’s 1846 journals. Bruce McKelvie, already a historian and a Sasquatch researcher, would have had little trouble in connecting the “Footstone” story with the Sasquatch — especially as a Lil’wat story-teller named Charlie Mack had already made the connection. So you can imagine how much fun these three men had with this story. Skeptics may scoff at the stories told of the Harrison Sasquatch Indians, people of the mountains, of immense stature, between seven and eight feet tall, ape-like creatures with shaggy hair covering most of their bodies…. Most of the local Indians and some white people have no doubt at all of the existence of the Sasquatch, in fact according to some Indians the Sasquatch were the only race of people on earth at one time. Green was reportedly dumbfounded when he read the story, but he soon became an avid collector of Sasquatch lore, according to Daphne Sleigh in The People of the Harrison (Abbotsford: Abbotsford Printing, 1990). On Friday April 1, 1955, Green’s newspaper reported that a Sasquatch seized a woman from the front lawn of the Harrison Hot Springs Hotel, and ran off with her into the bush. In June 1956, Sasquatch hunter Rene Dahinden arrived in Harrison Hot Springs, eager to prove the existence of this creature. Dahinden was an immigrant from Switzerland, a farm worker in Alberta who had developed an interest in the Sasquatch. The current newspaper headlines read: “Two Men going into Bush in Search of Sasquatch.” But after an unsuccessful search, Dahinden emerged from the bush and left Harrison, supposedly to raise more funds for a second expedition. Though Sasquatch stories continued to appear in Green’s newspaper at regular intervals, no one appeared willing to contribute funds for the search. Green’s July 1, 1957, editorial complained that “Most of our readers will have noticed by this time that the Harrison Sasquatch Expedition (under Rene Dahinden) appears to exist only in the newspapers.” The problem, he said, was that no one outside Harrison Hot springs had contributed money to the fund, and if local business people wanted the publicity that this expedition would bring to their area, they would have to pay for it themselves. Harrison Hot Springs finally convinced itself of the marketing potential of the Sasquatch, and contributed $1,000 toward the expenses of the supposed expedition — money that probably went toward erecting a welcome sign graced by an enormous neon Sasquatch on the outskirts of Harrison Hot Springs. And as the tourist season kicked off, John Green reprinted an old story about a humming Sasquatch that attempted to hypnotize a local women. He followed that story up with others, and the stories became more unbelievable every week. However, other newspapers picked up Green’s stories, and the tourists flocked to Harrison Hot Springs! Sasquatch was the English version of words meaning ‘wild man of the woods,’ used by several Indian tribes to describe the hairy two-legged creatures long encountered in the mountains of British Columbia and Vancouver Island…. Green added that if he remembered correctly, the earliest known sighting between a white man and the creatures took place in 1864 [sic] when an officer of the Hudson’s Bay Company traveled through the Fraser River country, in present-day British Columbia. This man, Alexander Caulfield Anderson, had come west to explore and establish the most practical route for fur brigades to travel between the Company’s posts on the coast, up the river and over the mountains into the interior. In his journal the fur trader reported that ‘hairy humanoids’ had hurled rocks down on his party as it worked through the awesome canyon of the Fraser River. Sanderson interrupted to ask if Anderson had included a physical description of the creature in his journal. Kidnapped, the newspaper publisher declared seriously. In his files he had both the story written by the prospector and an affidavit attesting to its truth…. I checked out Marian Templeton Place in Something about the Author: Facts and Pictures about Contemporary Authors & Illustrators of Books for Young People (Detroit: Gale Research, 1972) vol 3, p. 160. You might find this encyclopedia in your local library, in the Children’s section. Marian Templeton Place was a children’s writer who enjoyed penning stories of the old west. However, every once in a while she took a break from gold rush and gunfighter stories, to write about monsters. Her Sasquatch books might be found still, in the youth non-fiction section of the local library, filed alongside books about the Loch Ness Monster and UFO’s. Even though Marian Templeton Place is well known to be a writer of youth fiction, her Sasquatch books, including Bigfoot All Over the Country, are regularly cited as reliable sources in many books and articles about the Sasquatch! There’s lots of information about the Sasquatch in libraries and books, although by now many of the books I accessed years ago are no longer in the library (and are, for the most part, not preserved in archives). However, this one might be available — Greg Long’s The Making of the Bigfoot: the Inside Story (New York: Prometheus Books, 2004). John Green is a character here, as is the above mentioned zoologist Ivan Sanderson. It appears they exerted a ton of effort in their search for the Sasquatch, but failed to find solid evidence the creature actually existed. In the 46 years since I first heard that A. C. Anderson was supposed to have written of a Sasquatch sighting I have yet to encounter any indication that he actually did so, in 1864 or any other year. I have read in the original his account of exploring the Harrison Lillooet route bypassing the Fraser Canyon, which is where such a report was supposedly to be found, but there is none. Anderson heard the story of the Transformers, two magical groups of people who came from opposite directions to meet at this place. After transforming the lives and cultures of all the people they had found, one Transformer stamped his footprint into the stone to indicate the boundary between the Upper St’at’imc, who lived on the Fraser River and the lakes that Anderson had already passed, and the Lower St’at’imc or Lil’wat tribes on the rivers and lakes he had yet to reach. Sasquatch researchers have transformed this story into the Natives telling Anderson about the Sasquatch. 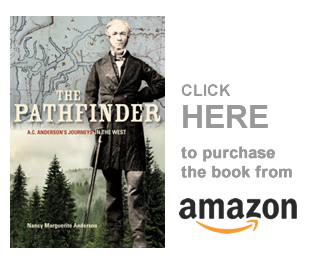 My first book, The Pathfinder: A.C. Anderson’s Journeys in the West, is available in softcover here: http://www.heritagehouse.ca/author_details.php?contributor_id_1=2447 I also have copies to sell, so contact me. My second book, Working Title: “York Factory Express,” is in the hands of my editor, and I have already started to write my third book — Working Title: “Brigades.” Its exciting times, always, starting to write a new book! But its also easier, every time. Copyright, Nancy Marguerite Anderson, 2014. [Updated, August 26, 2015]. All rights reserved. There is actually an earlier sighting than that. In 1811, a trader for the northwest tradind company had a sighting in Alberta, Canada. Thank you. I will do that!!! A fur trade sighting is delightful! Your article begins with an unfortunate typographic error that sets up a confusing chronology. J. W. Burns wrote his article on First Nations’ traditional stories of unknown hairy forest giants in 1927, not 1827. Burns coined “Sasquatch” during his 1920s’ writings. I saw the track of a large animal, has 4 large toes, about 3 or 4 inches long and a small nail at the end of each. The ball of his foot sank about 3 inches deeper than his toes. The hinds part of his foot did not mark well, the whole is about 14 inches long by 8 inches wide and very much resembles a large bear’s track. It was in the rivulet in about 6 inches of snow. Thanks. Yes, I should add that into the post now that I have it (probably had it already, somewhere).